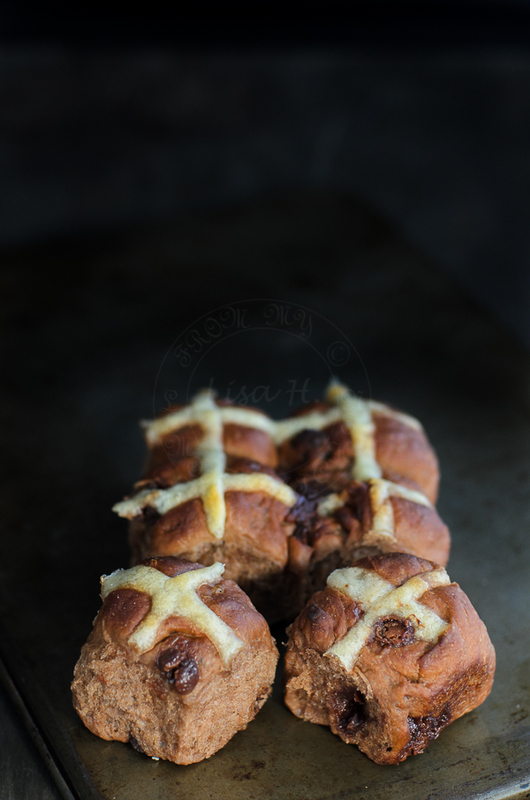 Its time for some hot cross buns in my tummy. 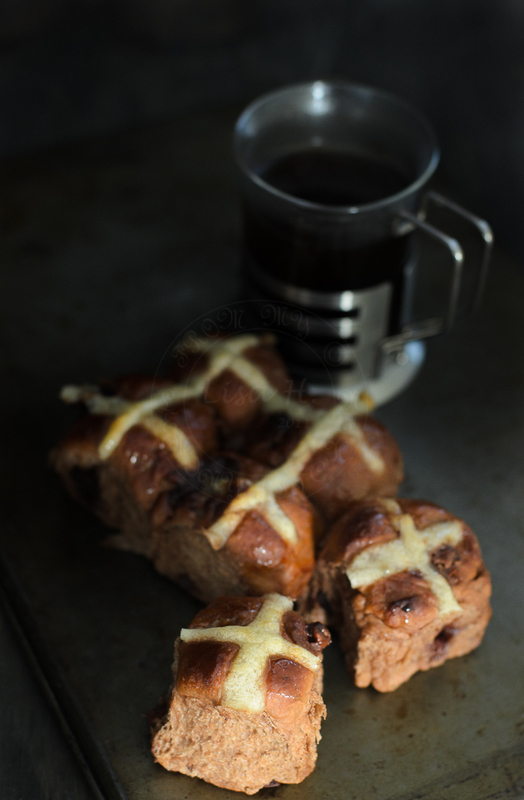 Hot cross buns were out early this year. 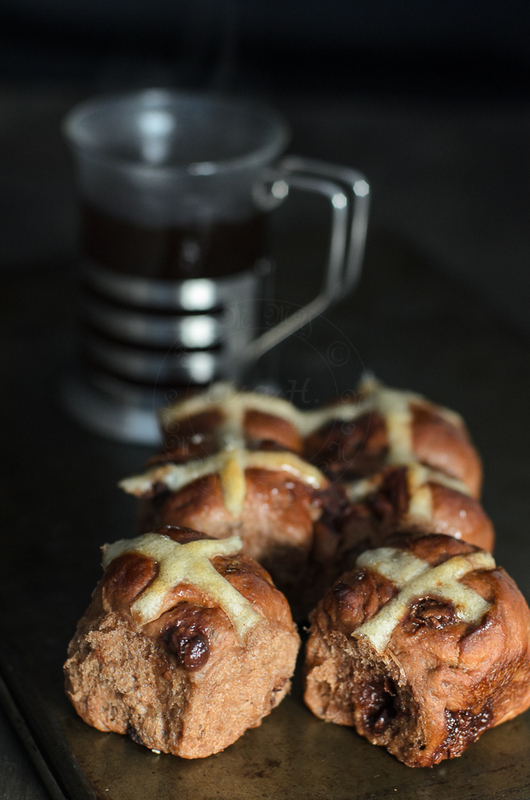 Love the buns from Woollies especially the chocolatey ones, but they are dearer in price to that traditional fruity hot cross buns. mix milk and bread flour in a small pot. Over slow to medium heat, heat up the mixture. Keep stirring until the mixture thickened 'goo-like' consistency (or if you own a thermometer, stop when the temperature reaches 65C) ). Transfer to another small container or bowl (approximate weight is 135-137g). Place a glad wrap over the mixture and refrigerate overnight. Take the roux mix from the fridge. Let it sit on the kitchen benchtop, to bring it to room temperature. Warm up 190ml milk in microwave for 30 sec (if the milk has been sitting in the fridge). Stir and making sure milk is not too hot for yeast. Add yeast into milk, stir and leave it aside for 5-10 minutes. Bubbles should start appearing by now (start again if no bubbbles). Weigh dry ingredients into mixing bowl. Add room temperature Roux mix into the mixing bowl. Add milk-yeast mixture into the bowl. 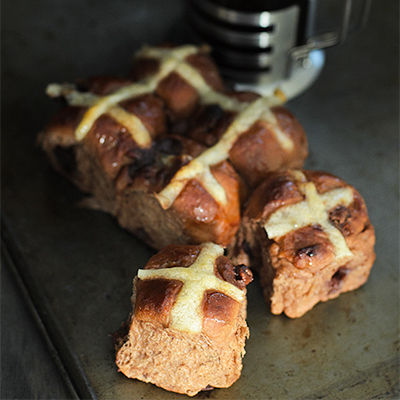 Using kitchen benchtop mixer, mix at slow speed until the ingredients comes together forming a ball of messy dough. Increase speed to medium (no 4 on my ancient Kenwood ;P). Knead for until the dough and butter mix well and homogenous for another 5-8 minutes. The dough is in the state of sticky mess (Note : at this stage the dough looks very soft and gooey and you will be tempted to add more flour... DONT!!!! add flour). Coat your fingers (and palms too) well with cooking oil, and with your fingers pinch a good size of dough and stretch, making sure that the dough is elastic and pass the window pane stage (if the dough breaks and fail window pane stage, mix for another 3-5 minutes). With well oiled fingers and palms, lift up the dough, add about 2 teaspoon of cooking oil (or spray), coat the bottom and sides of the bowl, and roll the dough in (dough should be well coated with oil). Place a cling wrap plastic over the bowl. Rest the dough for at least 1 hour or double in size. Punch the dough down, and divide into 25 pieces (approximate 37g). Spray the top with oil and cover the buns with damp cloth. Leave it to rest for 45 minutes. Mix plain flour with water into a paste. Place in a piping bag. Set aside. Dough should doubled in size by now. Gently brush the top with milk. Piped two lines to cross. Rotate tray (for even cooking) and bake for further 5-7 minutes. Be careful not to overbake and burn the top of the buns ;P.
Very tempting and wonderfully chocolaty! They look so fluffy and soft! I can eat at least 3 at one go too.